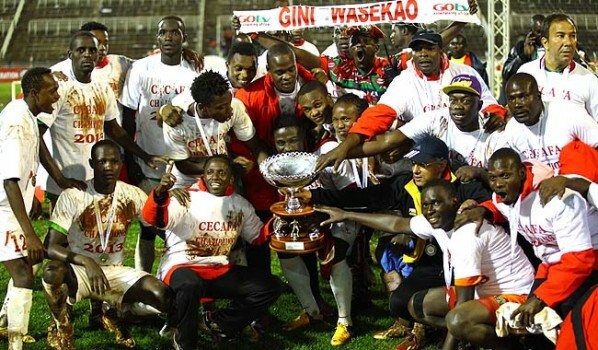 This year’s (2014) Cecafa Senior Challenge Cup will be staged in Ethiopia from November. The Council for East and Central Africa Football Associations (CECAFA) is an association of the football playing nations in Eastern Africa and affiliate of CAF and FIFA. Kenya have wins the 2013 Cecafa Senior Challenge Cup after a 2-0 win over Sudan in the final at the Nyayo Stadium in Nairobi. Harambee Stars skipper Allan Wanga was the host nation’s hero, after he scored in each half to bring Kenya the regional trophy for the first time since 2002. It came on the day Kenya celebrated 50 years of independence from British rule. It was also the first piece of silverware for coach Adel Amrouche since he took over in February. Wanga, the AFC Leopards forward, had already scored one goal in the tournament before the final. He started his scoring mission against Sudan in the 35th minute when he nodded in a well taken David Owino cross to give the Sudan goalkeeper Abdelrahman Ali no chance. Sudan, and the tournament’s top scorer Ibrahim Salah, continued to torment the Kenyan defence, but to no avail. Cheered on by the home fans, Wanga made it 2-0 in the 69th minute with a good ground shot. “I am so happy to score three goals in the tournament and lead Harambee Stars to victory” Wanga told reporters after the final. It had taken Kenya 30 years to win the Cecafa trophy on their home soil, a point Kenya’s coach was well aware of. “This is great and I praise the players for the job well done” said Amrouche. Sudan Coach Mubarak Suliman said it was not easy playing the hosts in the final, which was delayed for more than two hours. “The delay at the hotel also disorganised us,” said Suliman. Earlier, Zambia clinched third place after their goalkeeper Joshua Titima saved three penalties to hand the Chipolopolo a 6-5 shootout win over Tanzania. The game was tied at 1-1 after 90 minutes.